With a blend of folk and black metal, big moments, and stunning guest vocals, Forgotten Paths is a trek worth taking. Mixing folk music with atmospheric black metal isn’t a new concept by any means, but one of the best purveyors of this approach have returned with a new LP. Saor’s Forgotten Paths contains four new songs spanning 40 minutes, along with a notable guest spot from Neige of Alcest on the title track, which also opens the record. As expected, the atmosphere is thick and foggy, with a post-metal approach providing layers of sound to digest. Folk melodies show themselves in the opening minutes of the song, and then recede before the black metal storm comes crashing back in. The raspy growls of band mastermind Andy Marshall are complemented on this song by Neige’s wispy reprises; the combination makes for a unique listening experience. One of the things that I have always loved about Saor is the diversity of approaches that they take on an album. As the first song comes to a close, there is a pretty drastic shift into piano, and while this progression is somewhat jarring, it dovetails nicely into the second song, “Monadh”. The addition of vocal harmonies and the overall slower tempo makes this track a standout for me personally. In keeping with the title of the record and the mood of this song, this track really entices the listener deeper into the unknown as the album reveals itself little by little. As with many albums in this niche genre, the atmosphere takes center stage rather than fancy licks, vocals, or riffs. This is the case throughout the album, but that doesn’t mean that there aren’t incredible moments. “Bròn” finds several of the passages. The pace of the song from the very start is quicker than we’ve heard before, with some relentless drumming and excellent guitar work. All the while, the violin and additional strings build until the guest Sophie Rogers appears with a melodic break of sorts. This is easily one of the best segments on the record and it shines quite brightly. 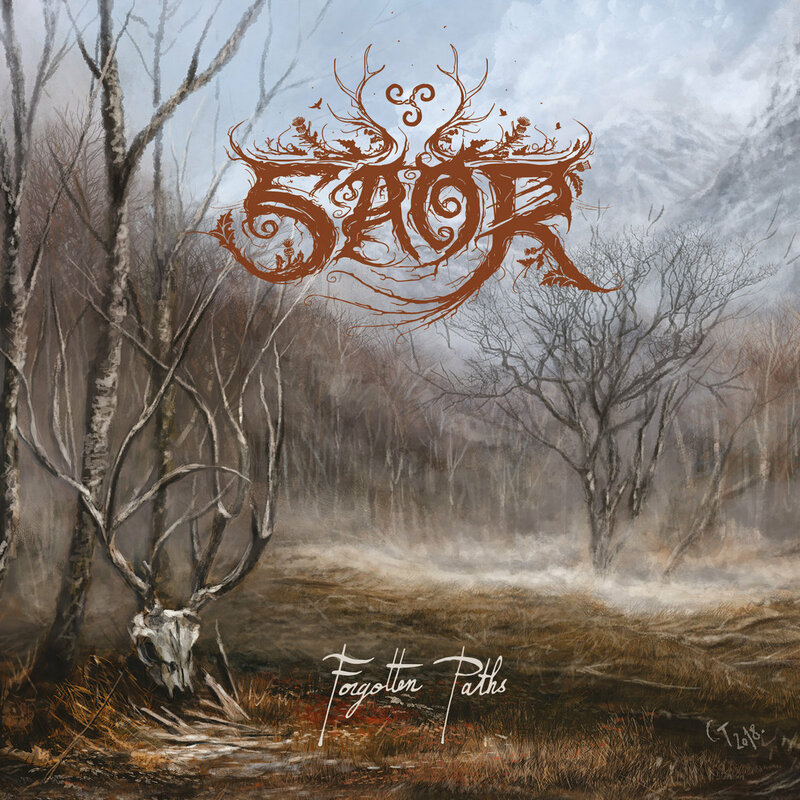 It also showcases something that makes Saor different from many other of the folk-influenced black metal outfits. The folk elements are pulled from the British Isles rather than the usual Scandinavian fare, and this influences both the instruments used and melodies as well – both of which are outstanding on this track. The bulk of the record is comprised of the first three songs, with the fourth, “Exile”, being a relatively quick five minutes. Taking that into consideration, the pacing of the record is interesting. The songs themselves are mostly self-contained and have their own ebb and flow. In this way, the record does feel like it lacks some cohesion in this aspect. Of course, stylistically, the record has one through line that is impossible to miss, and in the end, I think that is enough to hold Forgotten Paths together as an album. The production is also a step up from their previous outing, Guardians, allowing the density of the album to come through without missing the tiny details that make this band so unique. Forgotten Paths solidifies the idea that, when it comes to marrying folk and black metal, Saor should be your officiant of choice. With elements of doom and post-black metal to be found along with everything else this record has going on, it’s impressive that it still doesn’t sound overreaching or too busy. There is something to like about each track, whether it’s the charming guest vocals or the crushing atmosphere. The twists and turns on this journey make it one worth taking. Previous PostSwifan Eolh & The Mudra Choir - "The Key"